I love nothing more than having time in the morning to cook a proper breakfast – or better yet brunch – which in my book means it’s the weekend or a holiday and you are up late after a long lazy lie-in. In a matter of minutes a stack of golden pancakes awaits hungry mouths. Kitchen time has become scarce in recent months and so I appreciate it all the more. Today Minty and Rémy were playing such a great creative game outside in the sunshine with dollys and army men. When it came time to come in to eat Minty was thrilled we were having pancakes from scratch and asked for an extra serving for her dolly. Once I had whipped up a large stack for each of us I dotted the skillet with tiny drops of batter, each about the size of a nickel. The result, a stack barely taller than the raspberries! 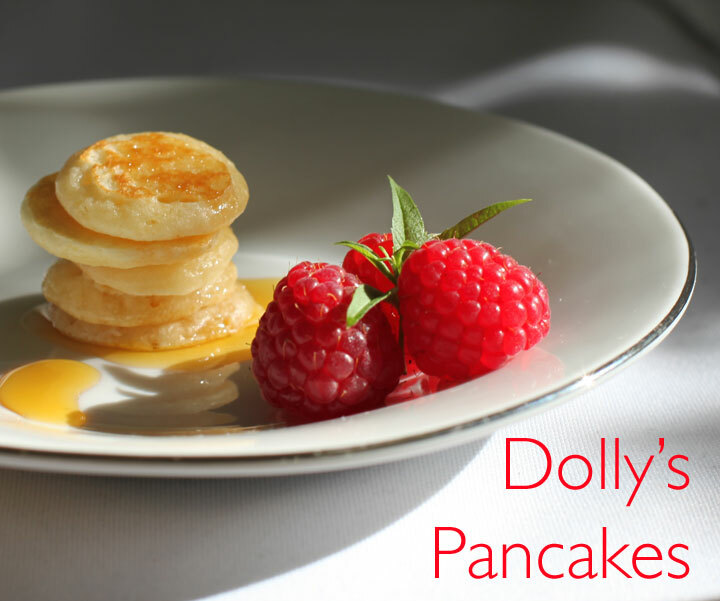 The photo above isn’t playing with perspective – rather than silver dollar pancakes we have teeny tiny silver nickels for dolly! 1. Sift the flour, sugar, baking powder and salt into a small bowl and mix together, set aside. 2. In the KitchenAid, whisk together milk, egg and butter. Add the dry ingredients and mix until combined. 3. Heat a large nonstick skillet over medium heat and oil with the paper towel. 4. Using a small ladle make 3 small pancakes (about 3 inches in diameter) on the skillet. Cook until the surface begins to form bubbles and the underside is golden brown. Flip using a fish slice and cook the other side until golden brown (about 2 minutes each side). Continue to cook in batches of 3, wiping the pan with the oiled kitchen towel each time, until all the batter is used up. 5. Stack, drizzle with maple syrup and a dot of butter and serve immediately. these are so perfeclty adorable! yum! Pancakes are the best way to wake up on a weekend morning! Yum! The little pancakes are adorable! So sweet – I remember eating tiny pancakes when I was little! Fun! I love a good pancake recipe! I could these a dozen at a time 🙂 Looks scrumptious!